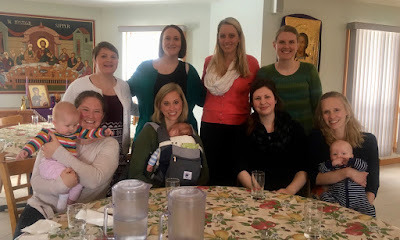 The Pittsburgh Mom's group visited on March 11th. Mother Christophora and another sister spoke at a women's retreat in State College, PA, also on March 11th. On March 16, Bishop Neofitos of the Diocese of Nyerni in Mount Kenya visited the monastery. On March 18th, the two-year memorial for Protopresbyter Thomas Hopko was served after Divine Liturgy. A regional OCF retreat was held here on Saturday, April 1. Holy Trinity Church brought their HOPE and JOY groups here on Sunday, April 2. The youth helped to chant the vespers service.